Casual in style this quaint chair can be used in any style home from traditional to contemporary. 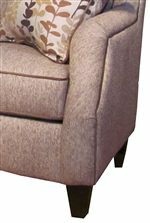 Simple track arms feature plush padding and frame an attached pillow back and loose seat cushion. Tapered block legs will pair nicely with any of the 500+ upholstery options this chair is available in. Create a piece that is truly your own by adding this cozy chair to your home. 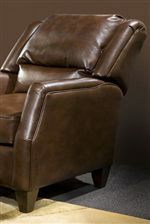 The Russell Casual Modern Chair by Marshfield at Saugerties Furniture Mart in the Poughkeepsie, Kingston, and Albany, New York area. Product availability may vary. Contact us for the most current availability on this product. The Russell collection is a great option if you are looking for Contemporary Casual furniture in the Poughkeepsie, Kingston, and Albany, New York area.